LEXINGTON, Okla. — It’s not something you see every day. Prisoners willingly giving back from behind bars. “Some people look at me like I'm doing a lot of work, but I look at it as a privilege and a blessing,” inmate Eric Fowler says. “See where that yarn rides across there?” inmate William Franklin asked. "How long you been working on this thing?" “Oh, about a year,” Franklin said. The patriotic pattern slowly takes shape. Here at Joseph Harp Correctional Center, you’ll find an army of incarcerated volunteers giving thanks to military veterans. 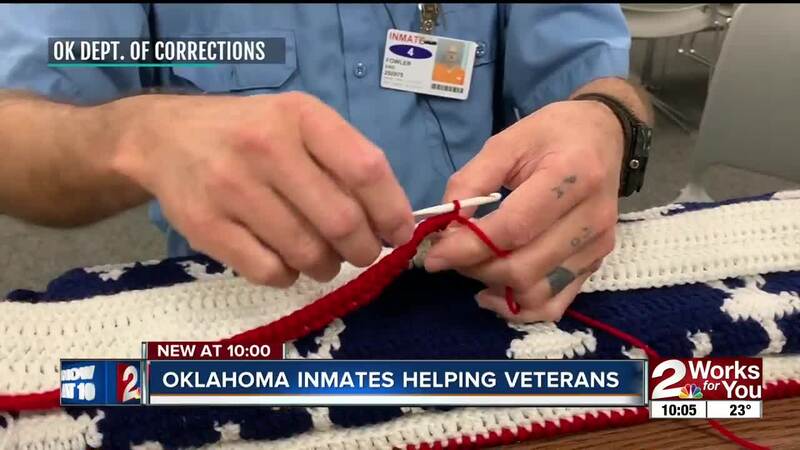 Fowler is the coordinator of the flag afghan project, using donated yarn and inmate labor. “I have taught Marines how to crochet; I have taught murderers how to crochet... guys who before they got involved with the afghan project were nothing but bullies,” he said. This team has crocheted hundreds of American flag blankets. “Every state in the union has at least one flag and seven different countries,” Fowler said. Heart and soul are woven into every afghan. “We spend a lot of time praying for people when we make these flag afghans,” he said. “Though we cannot serve our country, we will serve those who have,” Fowler said. One afghan went to veteran Guy Groniger. The group also makes hats and scarves for the homeless and toys for disadvantaged children.